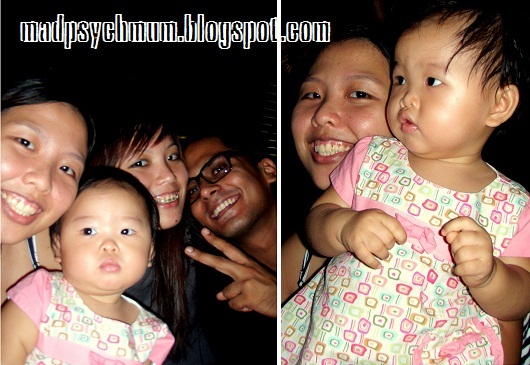 Girlee's playdate with Baby A was held at the hubby's ex-colleague's house at a condo along River Valley. We hung around and chatted while waiting for Baby A to arrive. But soon, baby girl got bored with crawling around on the carpet (which she really liked)..
..and started playing with mummy's necklace and bangle! Not long later, Baby A finally arrived. The last time we saw him was during his 1st month celebration when he was only a tiny baby. He has since grown into a really tall baby and is still as smiley as ever. Of course we had high hopes of them interacting but kids at this age are just not cognitively developed to play socially with each other yet. Instead, they only acknowledge the presence of the other and play beside each other. So after a while both started to crawl around on the carpet trying to get their hands on everything but were promptly stopped as we probably might not be able to afford to replace anything should anything get broken. Thankfully, both kids were very well-behaved. After a nice playdate, the hubby sent baby girl and I to Marina Square where we met up with my mum, sis and her bf (aka Styluxtakut). 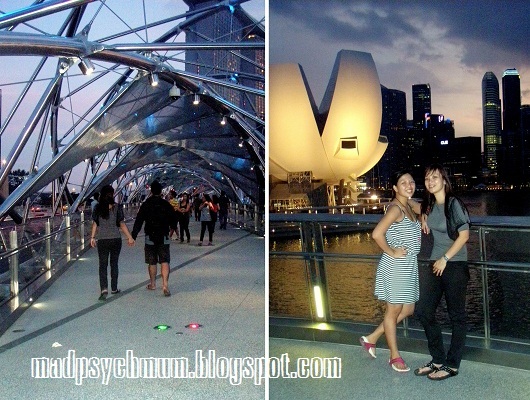 We then decided to walk to Marina Bay Sands (MBS) via the Helix Bridge so that we can admire the beautiful view! Then, as we were looking down on the MBS Skating Rink from Level 4, we had a heated discussion on whether or not the kids were ice skating on actual ice. Me: "Of course it's ice! Like duh!" Sis: "It's not ice lah! Styluxtakut: "Look, the kids can just lie down and not feel anything!" Sis: "And they are not wearing gloves!" Me (in retort): "Maybe they don't require it? I've been here countless of times. It's ICE!" So, in order to prove that I'm right (which hello, obviously I am), we went to check out the skating rink. And lo and behold, guess what? Yours truly was exactly right. Of course it's ice (albeit a little artificial)! Anyway, we were at MBS to watch Wonder Full, which is also Southeast Asia's largest light and water show. The last time that we were at MBS, we were too lazy to actually sit in the audience and naively thought that we could view the show from our hotel room, which overlooked the arena. Obviously, that's ridiculous. But tell that to the hubby who really didn't want to sit in the crowd out in the hot and humid weather (which also explains why he wasn't with us this time as well). We waited patiently for the show to start, some less patient than others..
"Gimme a break. I just woke up from a nap aite.."
Playing a fool with the camera while waiting.. 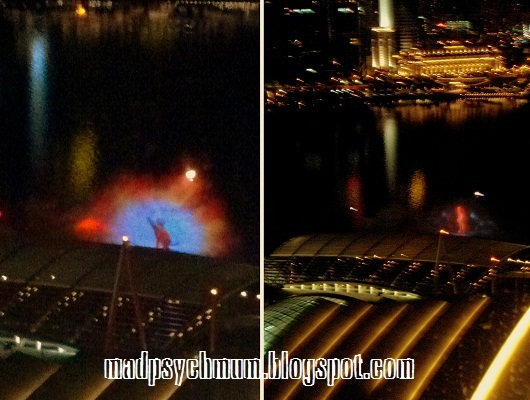 Compared to Hong Kong's Symphony of Lights, the MBS fountain show was definitely way better! It was almost a 4D experience, with an array of bubbles, lasers and pyrotechnics peppering the fountain display throughout the show. I have to say, it was almost as good as the Songs of the Sea except that it is free! You should really check it out! They have a show at 8pm and 9.30pm everyday.